Reebok is an American-inspired, global brand that creates and markets sports and lifestyle products built upon a strong heritage and authenticity in sports and fitness categories. The brand is committed to designing products that constantly challenge the norm. Reebok understands that people are, above all, unique. Reebok’s positioning reflects this by celebrating the distinct qualities that make people who they are. Reebok is dedicated to providing each and every athlete - from professional athletes to recreational runners to kids on the playground - with the opportunity, the products, and the inspiration to achieve what they are capable of. We all have the potential to do great things. As a brand, Reebok has the unique opportunity to help consumers, athletes and artists, partners and employees fulfill their true potential and reach heights they may have thought un-reachable. Featured Products Reebok Shoe keeps the retro look alive with the reissue of the smooth Classic Leather sneaker. Mesh and leather upper in a vintage athletic running shoe style with a round toe. Contouring multi-colored stitched leather overlays and logo side striping . Achieve Maximum flight with the lightweight ATR Vertical III on-court speed basketball shoes. Mesh and leather upper with responsive Play. Dry moisture-wicking lining Side perforation details and sturdy breathable mesh panels Padded high-rise collar. The Court Victory Pump SF by Reebok features: Athletic hi performance basketball sneaker with built in Hexalite technology Winning combination of smooth and patent leather panels Perforated toe box for breathability Advanced features include trademark. The Freestyle Hi Jewels by Reebok features: Smooth leather panels, with metallic stripes on outsole Wrap around rhinestone studs along ankle Self tie closure, with dual velcro straps Removable rhinestone lace charm High top design Padded ankle. 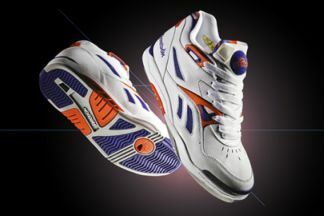 The Pump Omni Lite Retro by Reebok features: Hexalite technology in sole for lightweight cushioning and superb performance Full cushioned body for comfortable wear "The Pump" on tongue for enhanced performance, ridged button on side of pump to deflate.